An assortment of fork designs, for everything from Victorian green corn, to baked potatoes, bread, butter, ice cream and cheese ~ Thomas Coryat was an English traveller and writer of the late Elizabethan and early Jacobean age (c. 1577 – 1617). He is principally remembered for two volumes of writings he left regarding his travels, often on foot, through Europe and parts of Asia. He is credited with introducing the table fork to England, with "Furcifer" (Latin: fork-bearer, rascal) which then became one of his nicknames. The fork he described had two tines. Since then, forks have been designed with many more than 2 tines. Some forks have up to 7 or 8, depending on what one is serving. Antique melon forks ~ Perfect for cantaloupes, watermelons, honeydew melons, etc. Though the fork's early history is obscure, the fork as a kitchen and dining utensil is believed by some to have originated in the Roman Empire, or perhaps in Ancient Greece. Others believe the fork's origins to be in Africa or the Middle East. The origins of personal table fork's are believed to be in the Eastern Roman, or Byzantine, Empire. Use of the fork spread slowly during the first millennium CE and then spread into southern Europe during the second millennium. Forks did not become common in northern Europe until the 18th century and were not commonly used to eat in North America until the 19th century. 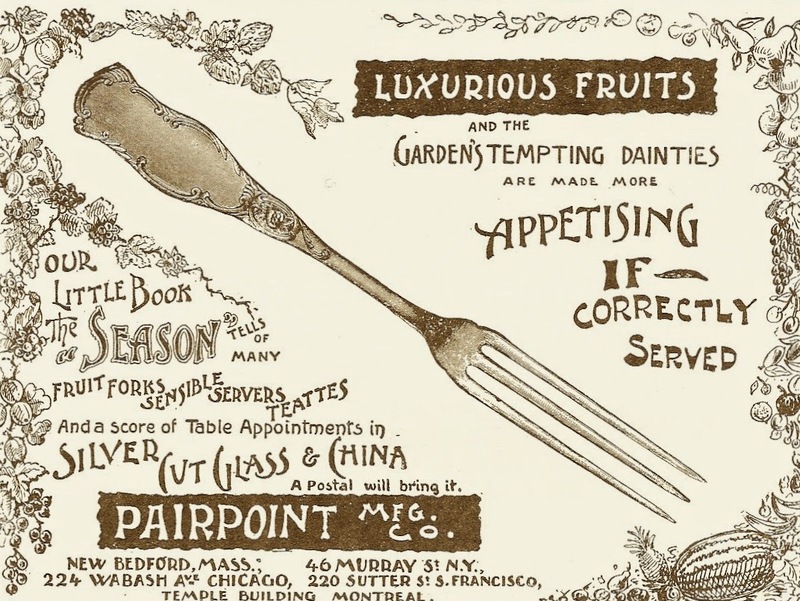 By the mid 1800s, forks were being designed for nearly every type of food, and were considered necessary to every proper home's table. Forks had also to be made and sold, then produced in versions which more and more people could afford, as they slowly ceased being merely unnecessary and became the mark of civilized behaviour. Manners have indeed changed. They were not invented on the spot, but developed into the system to which we now conform. Since manners are rituals and therefore conservative -- part of their purpose is always conservation -- they change slowly if at all, and usually in the face of long and widespread unwillingness. Even when a new way of doing things has been adopted by a powerful elite group -- using forks instead of fingers, for example -- it may take decades, even centuries, for people generally to decide to follow suit. Forks had not only to be seen in use and their advantages successfully argued; they had also to be made and sold, then produced in versions which more and more people could afford, as they slowly ceased being merely unnecessary and became the mark of civilized behaviour. After the eleventh-century date of the first extant document describing (with wonder) the sight of someone using one, the fork took eight centuries to become a utensil employed universally in the West. From Margaret Visser's "The Rituals of Dinner"
Meet Fork In Box. Fork, meet reader. “Meet Fork in Box” was the misspelled listing I found on eBay that allowed me to snag my second Dutch mango fork. Obviously a misspelling, I am sure the German Ebay seller who listed this beauty meant to list a “meat fork in box”. Before I go any further however, I should tell you a bit of my history with this odd utensil. In reality, I have never met a fork I didn’t like. My preoccupation with forks began not too long after Disney’s Ariel made her landing at the box ofﬁce. Katie, my daughter, was almost three. She was enthralled with the precocious sea maiden who had red hair the color of her own. By the time the VHS tape was running continuously at home, I was starting an etiquette business for children and teens. The majority of the kids I taught were so used to fast foods, they rarely ate at a family dinner table. Showing them interesting and odd looking forks, along with other unusual utensils, was a way I found that kept kids interested when I talked of setting the table at home. I needed to do something to catch their wandering attentions, and strange utensils ﬁlled that need. 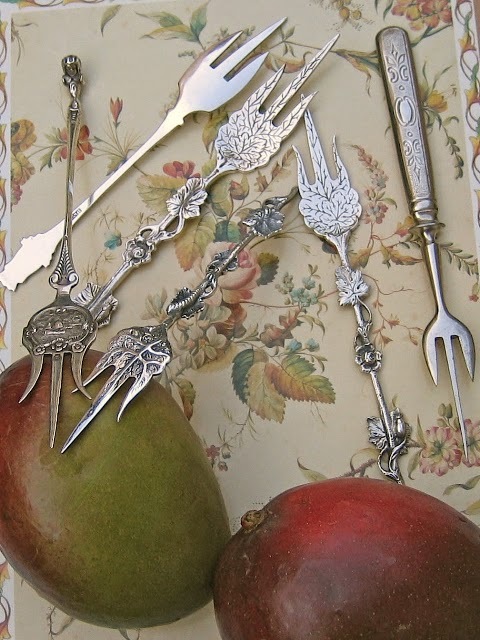 Several Dutch mango forks ~ Many Dutch feel these forks are better suited to cake. All of these pictured are Dutch, save the fork on the far right. It was from South America. My husband was great at sussing out unique forks for me in the beginning. We stopped in thrift and antiques shops to ﬁnd odd things for the table that were relatively inexpensive. Utensils over $10.00 seemed pricey. After all, these were props for my students to pass around and examine. Sales of very old used books on silver at the local library were how I did my research on pieces we’d found. Some were sold for only a quarter. I use them for reference still. Anything Victorian was popular during the 1990s. Tea rooms were sprouting up in malls, while magazines and books devoted to the subject were readily available. 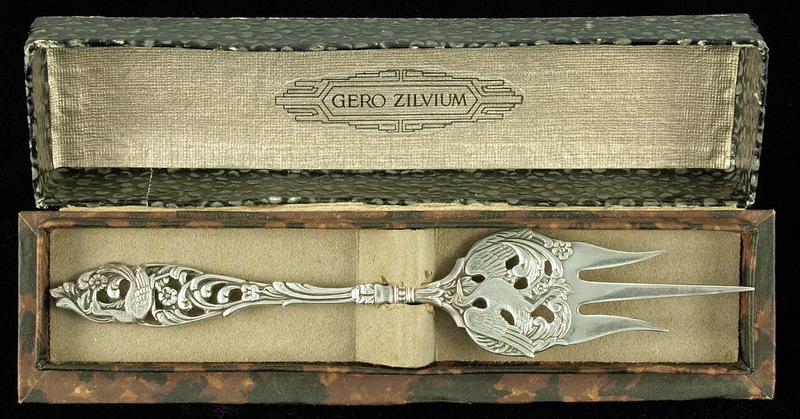 Over the next few years, as my collection of table silver oddities grew, my forays for the rarest of forks became more time consuming. Any weekend outing meant a side trip to a thrift shop or antiques mall. I was asked to give talks and lectures on not just my collection, but how people in America once dined with grace and forethought. At least more forethought than wondering if “... you want fries with that?”, before being handed a bag of fast food through the car window.